This Charter has been developed by volunteers from the city of Salford with input from local volunteer-involving organisations. 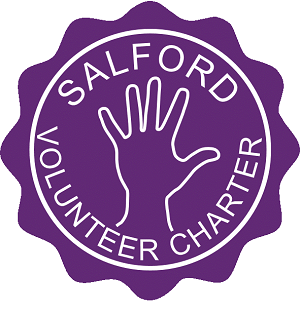 The Charter sets out the commitment of organisations in Salford to acknowledge the rights and responsibilities of volunteers. By signing up to the Charter organisations are sending out a clear statement that people volunteering in Salford do so within a positive and supportive environment. Sign up to the Charter here. View a list of organisations who have already signed up to the Charter.